Medically supervised drug and alcohol detox is a safe and secure way for someone suffering from addiction to pass through the withdrawal stage. For those who are looking to address drug and alcohol abuse or addiction, medically supervised detox can be a vital recovery tool. When a someone addicted to a substance stops using suddenly, their body enters withdrawal and begins to clear toxins from its systems. In a medically supervised drug and alcohol detox, individuals are provided support and medication to aid in the detoxification process. Medically supervised detoxification is a process that assists individuals who are experiencing drug withdrawal. The detox process aims to provide a secure environment for a person to safely withdraw from substances of abuse, while reducing any potential harm that could occur during withdrawal. When someone uses a substance for any length of time, the body becomes dependent on that drug in order to function normally. Sometimes referred to as a “tolerance,” individuals may require larger doses to achieve the same effects. If drug use stops suddenly, the system experiences a type of shock, commonly known as withdrawal. The withdrawal stage can include mild to severe symptoms as the body begins to detox the system of remaining toxins from substance abuse. Some substances, like benzodiazepines and alcohol, have dangerous withdrawal symptoms that can be life-threatening. Other substances, such as opioids, produce withdrawal symptoms that are not usually hazardous, but can be extremely uncomfortable. Some people may attempt to detox at home, but this can be risky. Detox should always take place under medical supervision in order to ensure the individual’s safety. Once someone has successfully detoxed, they are able to progress into addiction treatment, where the psychological, social, and behavioral problems of addiction can be addressed. While many substances have adverse effects on the body, there are certain drugs that will result in more dangerous withdrawal, thus requiring a more in-depth detox program. Withdrawal from stimulants like methamphetamine or cocaine can cause extreme mood imbalances, with a potential for dangerous and erratic behavior. Withdrawal from sedatives or depressants can have life-threatening complications, such as seizure or heart problems. Regardless of the substance(s) in an individual’s system, withdrawal can be mentally and physically agonizing and should take place under medical care. Depending on the drug and the level of dependence, withdrawal can last anywhere from a few days up to several weeks. Often times, withdrawal symptoms are so acute that a person cannot work or provide care for themselves or others. 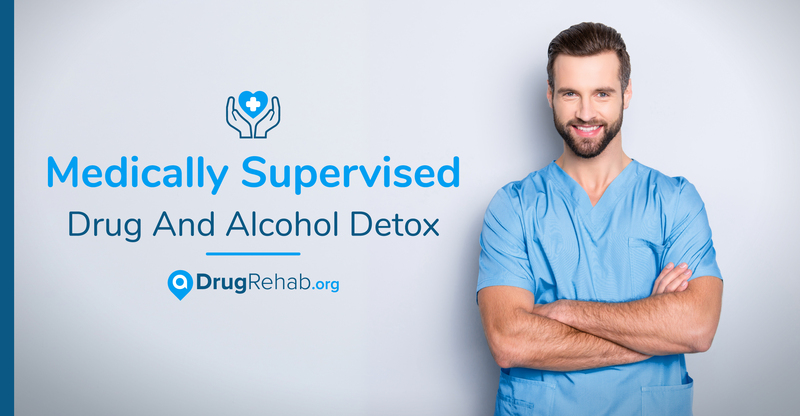 Medically supervised detoxification is a supportive environment aimed at reducing harm and providing aid for individuals experiencing withdrawal. This structured setting is set up to help individuals safely manage the symptoms of drug and alcohol withdrawal, allowing them as much comfort as possible. Medically Supervised Detox Process – What Is It Like? Undergoing a medically supervised detox may feel daunting, but it’s one of the most protected environments to be in during the detoxification process. Addiction affects people from all backgrounds and walks of life, and patients requiring detox have diverse ethnic, social, and socioeconomic backgrounds. Because the symptoms of withdrawal can be physically taxing, being in a monitored, supportive environment can be a comfort. The treatment teams that work in medical detox programs are provided with specialized training about addiction and detoxification and should always maintain a level of professional, compassionate care. The length of an individual’s stay in a medical detox is typically determined by the level of withdrawal severity, usage history, and drugs present in the system. Some detox programs are as short as three days, and others can last up to five or seven days. Evaluation: In the evaluation stage, a member of the medical treatment team administers tests and measurements to gauge the level of toxins in the body, as well as to assess the patient’s mental state. Comprehensive medical and psychological assessments are also given, enabling the treatment team to determine the necessary level of care. The treatment team may also seek to gain an understanding of the individual’s social situation, and determine if any family or friends are present for support. Stabilization: Next, both medical and psychosocial support are employed until the patient is restored to a stable, substance-free state. This can include medications that may be administered in order to stabilize the patient physically and psychologically, but some detox programs do not utilize medications. When the patient is able, the treatment team may discuss treatment options and explain the importance of the patient’s participation in their recovery. When appropriate, physicians may include family members, employers, or significant persons in this stage. Treatment: Finally, a plan for general treatment is made. In this stage, the medical treatment team helps the patient select the treatment approach they think to be the best fit, and physicians may prescribe any ongoing medication or therapeutic interventions necessary for the patient’s health. If the patient has a history of completing detox and failing to attend treatment afterward, a written contract may be agreed upon in order to encourage further care. These documents are not legally binding, but serve to encourage the patient to take an active role in their recovery. The patient and treatment team should have an action plan and established contacts before the detox is considered successful and complete. While detoxification seeks to reduce the intensity of withdrawal, it is not considered a treatment for addiction. Once an individual successfully detoxes, inpatient treatment is recommended as the next level of care, where the physical, psychological, and environmental impacts of addiction can be addressed. Inpatient care provides addiction treatment in a residential setting that is centered around a structured, community environment where individuals can begin their recovery. Patients may participate in individual, group, and family therapy, as well as experiential therapies such as art, music, and equine. Patients may be provided education on addiction, identifying emotional triggers, preventing relapse, trauma recovery, and a host of life and relationship skills. Holistic treatment: This type of facility may utilize treatments such as yoga, acupuncture, mindfulness, and meditation as alternative coping mechanisms. Luxury treatment: These rehab centers offer exclusive amenities in addition to traditional treatments, including fine dining, personal sober companions, and private, upscale accommodations. Luxury facilities provide an unmatched level of discretion and personalized care. Faith-based: These treatment programs usually offer a blend of 12-Step therapy and faith-based or Christian counseling, and a strong focus is placed on biblical values and beliefs. Some secular programs offer a faith-based track, for those who desire a religious focus in their recovery. Non-faith-based, non-12 Step: For individuals who prefer a more scientific approach to their recovery, there are treatment centers that focus on brain development and restoration, as opposed to a focus on the spiritual component. Gender-specific treatment: Because addiction treatment is so personal, many people are more comfortable being surrounded by their own gender. This promotes safety and openness when sharing with a counselor or in a group therapy session. Treatment centers with a specialized focus on the LGBTQ+ population are also available. Court-ordered treatment: For individuals who are sentenced to complete a court-ordered rehab program, many treatment facilities provide state-sanctioned treatment components such as anger management and driver’s safety, to fulfill any legal requirements. Historically, those suffering from addiction and withdrawal were largely stigmatized and left to care for themselves. Thankfully, the science of addiction treatment has progressed tremendously, and there are now several medications available to assist individuals through the withdrawal stage. When rehabilitation centers provide detox services, doctors, nurses, and other professionals may prescribe and administer medications to aid in the withdrawal process. These medications alleviate withdrawal symptoms such as tremors and vomiting and also work to curb drug cravings. Once administered, the medical treatment team closely monitors the patient in order to check progress and reduce the risk of complications. Licensed therapists are also on hand during medical detox to help patients understand and conquer the social and emotional challenges of their substance abuse and addiction. One of the victories of medication-assisted detox is the patient’s lowered risk of relapse. When faced with the reality of several more days of symptoms versus another dose of the substance, many individuals relapse simply to avoid painful withdrawal symptoms (this is especially common with cases of opioid withdrawal). With the use of specific medications in medical detox, the risk of relapse can be greatly reduced. Medical detox program costs can vary, depending on the location and structure of the detox program. Some detox facilities are in a hospital setting, but many treatment centers offer these services on-site, and the price is included in the overall treatment cost. It’s a common misconception that drug and alcohol treatment is only for the wealthy. In fact, many rehab centers work with potential clients in order to ensure their care is made affordable. Most facilities accept private insurance to offset cost, and some treatment centers are covered through public insurance like Medicaid or Tricare. Certain rehab facilities accept scholarships, payment plans, and sliding-scale fees in order to reduce financial burden and ensure treatment accessibility to all. While medical detox can help an individual safely manage the distressing physical symptoms of withdrawal, it is only the first step in addiction treatment. Detox alone does little to change long-term addiction and drug use patterns, and comprehensive treatment is necessary to establish lasting change. Fortunately, there are ample treatment options to choose from, once medical detox is complete. Inpatient care: These treatment centers provide overnight accommodations, so clients can immerse themselves in the recovery process. Lengths of stay can range from 30 to 90 days (short-term treatment) or three months to one year (long-term care). Outpatient programs: In outpatient care, clients who have work or family commitments are able to attend a more flexible treatment program that offers morning and evening sessions. Accountability is maintained through group sessions and regular drug screens. 12-Step programs: Meetings within groups like Alcoholics Anonymous, Narcotics Anonymous, and Al-Anon (for families) are offered free of charge in most communities across the country. Individual and group counseling: Therapists are able to coach someone new in sobriety through the next steps of building their new life, and group sessions can be a source of support and motivation for those in recovery. Support groups: These groups are usually free or low-cost, and can be a vital part of building a network of support that is close to home. National Center for Biotechnology Information — Barbiturate withdrawal syndrome: a case associated with the abuse of a headache medication., The benzodiazepine withdrawal syndrome.